With the federal government now mulling a ban on handguns and assault weapons, the Coalition for Gun Control says Canadians need to start making some noise about tightening gun laws. 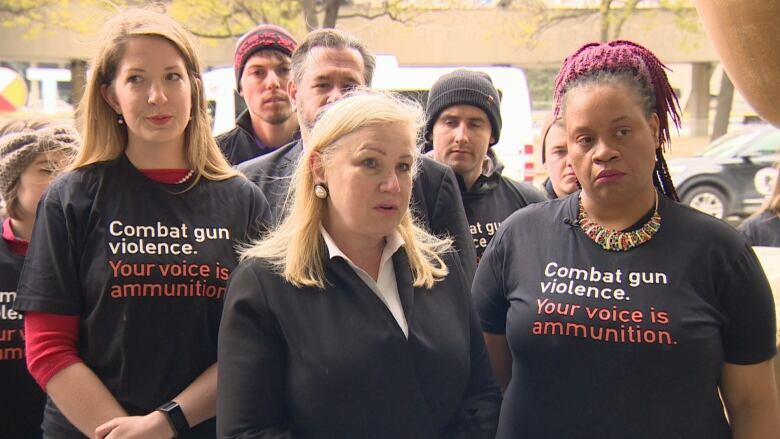 As the federal Liberals mull a ban on handguns and assault weapons, the Coalition for Gun Control has launched a national campaign to put their feet to the fire. 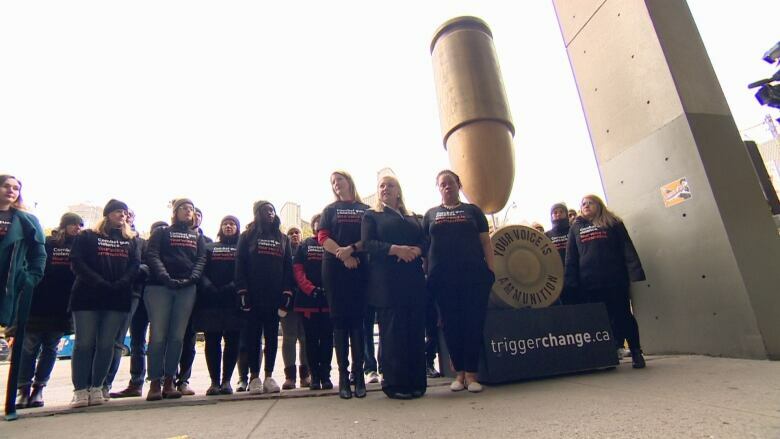 The "Trigger Change" campaign encourages Canadians to sign a petition and contact their local member of parliament to show their support for tighter gun laws. "We're asking Canadians to speak out before it's too late," said Wendy Cukier, president of the Coalition for Gun Control, at Tuesday's launch event. Standing at her side was Stacey King, whose two daughters were shot in a Toronto playground in June. "My kids are alive today, but the trauma is still in them," she said. In August, the federal Liberal government issued a mandate to Border Security Minister Bill Blair to look at a full ban on handguns and assault weapons — something Cukier says the vast majority of Canadians already support. "We know from the polls, without question, the majority of Canadians … want a ban on handguns, want a ban on civilian possession of military assault weapons," said Cukier. "The problem is they often don't translate those views into action." At present, most handguns are restricted in Canada, and buying them requires a special licence. Typically, those licences are given to people who will use the gun for target practice as part of their job, or as part of a collection. In the assault weapons category, semi-automatic, centre-fire rifles and shotguns (for example, the AR-15) are restricted, though some similar semi-automatic hunting rifles aren't. Cukier, who has worked on tightening gun control since 1989, when 14 women were shot and killed in the Montreal massacre, says things have gotten worse in recent years. What's changed, she said, is that domestically obtained guns are increasingly being used in violent crimes, and that the number of illegally owned handguns is going up. "For the first time since I've been working on this issue ... half of the crime guns that have been traced originate with Canadian sources, as opposed to being smuggled in from the U.S," she said. The idea that a rising number of crime guns come from domestic sources has been repeated frequently by Public Safety Minister Ralph Goodale, though a CBC report on that assertion found many people on both sides of the gun debate — including Cukier herself — decrying the lack of clear gun tracing data in this country. The federal government's move to look at a gun ban was sparked, in part, by the mass shooting in Toronto's Greektown in July — one of several high-profile shootings in a summer marked by gun violence. That month, Toronto's city council passed a motion to urge the province and the federal government to ban the sale of handguns and handgun ammunition in the city. On Tuesday, Cukier praised Toronto's municipal leaders for being national leaders on the issue. City councillors and Mayor John Tory, she said, "have set the tone for the entire country." Montreal has since followed Toronto's lead, passing a motion in council that calls for a nationwide ban on handguns and assault weapons. A spokesperson for Toronto's mayor wrote in a statement on Tuesday that Tory appreciates the Coalition for Gun Control's efforts. "Just last week, the mayor was urging residents to take part in the federal government's online consultation around a ban," it read. Since the idea of the ban was introduced at the federal level, a divide has opened up between urban and rural MPs in the Liberal caucus, with critics from rural areas warning that a ban would penalize lawful gun owners who use restricted guns for hunting or recreation. But Cukier says the argument that gun violence is an issue only for cities is flawed. "While people talk about this as being an urban issue, in rural communities the rates of gun violence are actually higher," she said. A ban on handguns and assault weapons, she said, would not impact weapons currently used for hunting. .
"Civilians do not need handguns. Civilians do not need military assault weapons," she said. Blair, who announced the invitation-only consultations for his gun control review in October, has said he wants them completed by the end of the year with a report coming in early 2019. A previous version of this story failed to mention a past CBC investigation into a statistic mentioned by Wendy Cukier. She is quoted describing a rise in the number of crime guns being traced to domestic sources. The CBC's previous reporting on that statistic raised doubts on the quality and quantity of gun tracing data available in Canada.